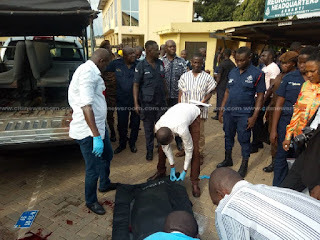 Seven out of the eight suspected robbers, whose attack reportedly led to the death of a Police Officer with the SWAT Unit of the Ashanti Regional Police Command, have been gunned down. The deceased officer, Lance Corporal Daniel Teiku, was on duty with his colleague, Lance Corporal Eric Nsiah, when eight masked men attacked the vehicle they were travelling in at Ayirebikrom near Manso Nkwanta on July 13. 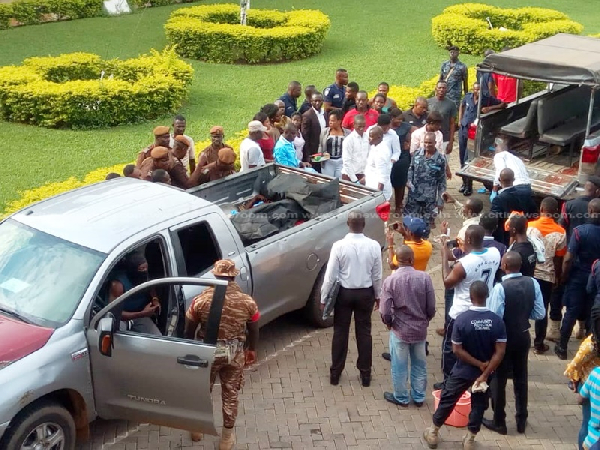 The bodies of the seven persons have been dispatched to the Komfo Anokye Teaching Hospital morgue. Police have postponed an intended press briefing on the incident to Wednesday, July 18, 2018. The deceased officer was on duty with his colleague when the incident happened. The two were on board a Sprinter Benz Bus with registration number AC-644-15 when eight masked men armed with AK 47 assault rifles and a pump action gun attacked the passengers at the outskirts of Ayirebikrom on Wednesday, July 11, 2018. The two police officers were overpowered by the masked men and were shot alongside with other passengers on board. The masked men seized the weapons belonging to the officers in the process. The officer was pronounced dead upon arrival at the Saint Martins Hospital at Agroyesum, while the other officer was treated and discharged. 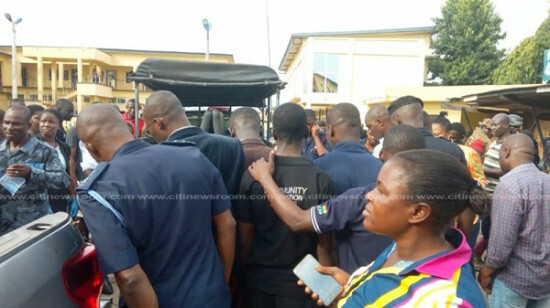 Ashanti Regional Police Commander, DCOP Akwasi Mensah Duku, told Citi News that police upon intelligence proceeded to Dome-Beposo, a village near Manso Nkwanta and retrieved four AK 47 assault rifles including those seized from the police officers. Police also retrieved one G3, an SMG assault rifle and a Pump-action gun. Other items retrieved include seven boxes of ammunition with each containing 25 rounds, 88 pieces of AK 47 ammunition and some clothes. DCOP Mensah Duku said police had been deployed to the area to search and arrest the suspects.